It took me about six years before I actually liked my classroom library. And it was important to me to like my classroom library, because if I didn't, who the heck else would? Certainly not my students. But I’m a tinkerer by nature, so I’m betting you will beat six years, or maybe you already have. Each year I gave quite a bit of thought to my classroom library, trying to think about what would make it better. 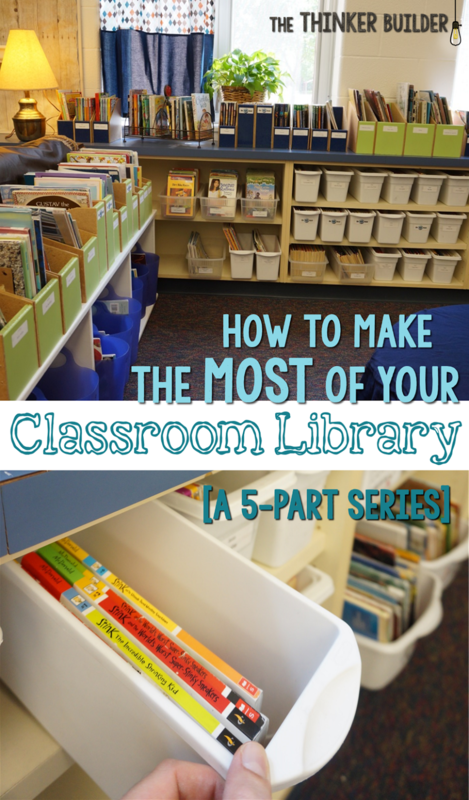 The classroom library is the most important place in my classroom, so I couldn't help but continue to make changes. And who am I kidding? I still tweak it here and there. Functionality: It had to be organized in a way that students knew where to find and return books efficiently. Character: It had to be a welcoming, interesting place to be. Longevity: It had to have enough books and enough ways to stay alive and running throughout the entire year. My classroom library has been working well for a few years now. It's not perfect, that's for sure, and it's ever-changing, because of the books being added to it (or taken out), because of me never being satisfied, but mostly because of the students who interact with it.